1. Check for software updates and make sure you have the latest version for your Mac (Mac OS X version 10.7.2). This will avoid problems when opening files within your web browsers. We also discuss this topic on Support for Mac OS X page. 2. Open your web browser (e.g., Firefox) and under the browser menu open Preferences. 6. 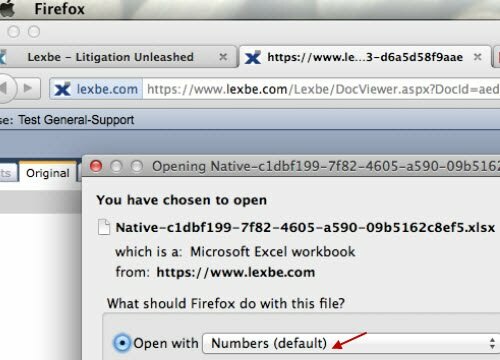 Close the Preferences window and login to your Lexbe eDiscovery Platform account, go to the ‘Browse’ page to view all document within the current case and select any native file document to be opened in a new tab (e.g. .doc/.xls/.ppt document). 7. In order to view the original file, click on the Original tab. A new window will be open and you should select the option according to the type of native file you selected. ‘Open with Numbers, Preview or Keynotes’. 8. The original document will automatically open itself in native view using one of the applications from ‘iWork’ from the Firefox browser. On this example, we selected an Excel file which will be opened using the application called 'Numbers' for Mac. Note: When using your Safari the configuration path is under ‘Help>Installed Plug-ins’ menu. Chrome can be configured to automatically native files, please open the page Viewing Original Files for more details. You can open, read and save locally Outlook. MSG files on your Mac by downloading Mac software such as MailRaider. 2. Make sure that you have the Word Browser Plug-in for Safari installed or updated by typing on the website address: ‘about:plugins’ or you can click here to download directly. 3. Go to your Lexbe eDiscovery Platform account and open the ‘Browse’ page to view all documents within the current case and select any word file document to be opened in a new tab. 4. Select the word document (.docx or .doc) or PDF file to be opened from the Document Viewer. From that window you will see the file displayed from the Native or Text (OCR extracted text from Original documents) tabs.